Sunday February 19 marked the 70th anniversary of the bombing of Darwin by the Japanese. Both the first and the single largest attack against Australia by a foreign power, it is often referred to as “Australia’s Pearl Harbor”. However, Darwin was bombed more heavily than Pearl Harbor, and almost 100 air raids were to follow. Numbers of the dead are disputed, but the official toll is just under 300, with maybe 300 to 400 injured. Amongst the casualties were men on the USS Peary, whose memorial President Obama visited in Darwin last year. 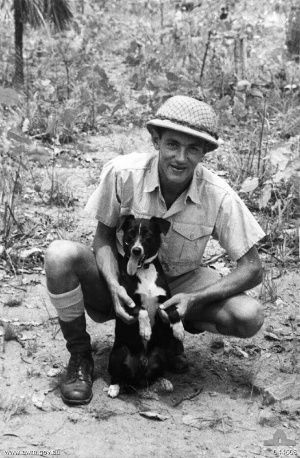 One of the lesser-known heroes of the Darwin air raids was a young black and white kelpie, who was found distressed and with a broken leg under a bombed mess hut on February 19 1942. He was taken to a field hospital, and immediately inducted into the Australian Air Force so that he could receive medical treatment. He was named Gunner, and given the serial number 0000. Leading Aircraftman Percy Westcott, one of two men who found Gunner, became the dog’s master and handler. I think Gunner was just expected to be a pet and a mascot for the air base, and probably a much-needed distraction for the men. However, about a week after he came to live with them, Gunner began to demonstrate his remarkable hearing skills. Time and time again, Gunner would whine and jump whenever he heard Japanese aircraft approaching. Long before the air raid siren sounded, Gunner would become agitated and head for shelter. He was able to warn Air Force personnel that the Japanese planes were coming up to 20 minutes before they appeared on the radar, and was so reliable that Percy was given permission to sound an alarm whenever Gunner gave his signal. You’d think that living on an airbase, Gunner would soon get used to the sound of planes taking off and landing, but he only behaved like this when he heard Japanese planes – Allied ones didn’t faze him at all. Gunner was accepted as a full member of the Air Force: he slept under Percy’s bunk, showered with the men, attended the movies with them, and regularly went up with pilots during practice flights. Percy was posted to Melbourne 18 months later, and Gunner remained with the RAAF in Darwin, being cared for by the Air Force butcher, who had access to plenty of meat to feed Gunner. It’s not known what happened to Gunner when the war ended; I hope he lived a long happy life. In the Air Force, the gunner is the person who operates the machine gun or cannon during air battles, although a Gunner is also any non-commissioned member of the air force in a Regiment. It’s often used as a slang term in several different ways, including in sport – for example, the word Gunner describes a certain specialist in gridiron, and the Gunners is a nickname for Arsenal Football Club. Gunners is also slang for a fans of the rock band Guns ‘n’ Roses. Gunner has been used as a stage name in professional wrestling, such as by Gunner Scott (real name Brent Albright). It also sounds like the Scandinavian name Gunnar, which combines the elements for “war” and “warrior” together, to sound extra-warlike. I’m not sure I would have suggested this as a possible baby name, except that I saw a baby called Gunner Phoenix in an Adelaide birth announcement last month. I can see this as a wonderful way to honour a military connection in a family. Gunner sounds all boy … although according to some people, it sounds all dog! But we have established that the line between dog and human names has become increasingly blurred, and if you were going to give your baby the name of a dog, then what cooler canine than an Australian kelpie who became a wartime hero? That was a wonderful story, and very educational for me personally. When I hear Gunnar I think of the band Nelson, which was comprised of Ricky Nelson’s twin sons, Gunnar and and Matthew. They had a couple of hits in the late 80s / early 90s. Ricky Nelson was a 50s/60s teen idol. I’m not sure if he was known outside the U.S. I do know of Ricky Nelson, but the twin band doesn’t seem to have penetrated my consciousness during my childhood and teens. I did live in a fairly isolated area though. I don’t think Gunnar is a very well known name here, and I think most people would just think of Gunner as an English vocabulary name. (Similar to Blaise and Blaze). It’s a lovely story to link with the name, and certain proof that a story like this can do wonders for people’s opinion of a name. Lovely story — what a wonderful dog! Haha, I didn’t know that! Lady Gunhilda is very formidable sounding though.